A brief snack and nap before the gladiators assembled by 2:30 for a 1:45 coach to the football ground where we met the Uzkabel team who thankfully looked our sort of age - 35+. 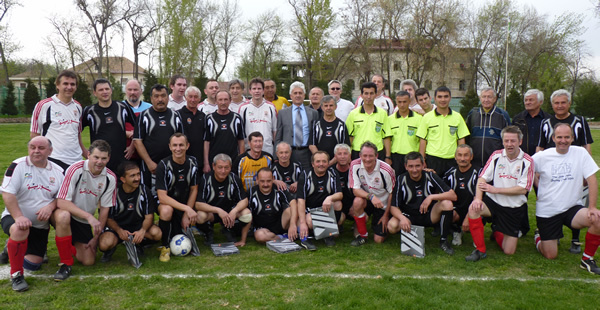 RCdeB were given gifts of Uzkabel team shirts then the referee blew for the start. At the outset it was apparent that they had a couple of players who were quick and knew what they were doing. RCdeB held off the attack for 20 mins before their no 9 swept passed the defence after we lost the ball on a corner. On this occasion the last man standing, Will Ollard didn't manage to prevent the inevitable lead. By half time 40 mins of excellent goalkeeping had kept the score to a relatively respectable 2-0. RCdeB reciprocated with gifts after half time of beautiful Union Jack playing cards and lovely little die cast London buses. 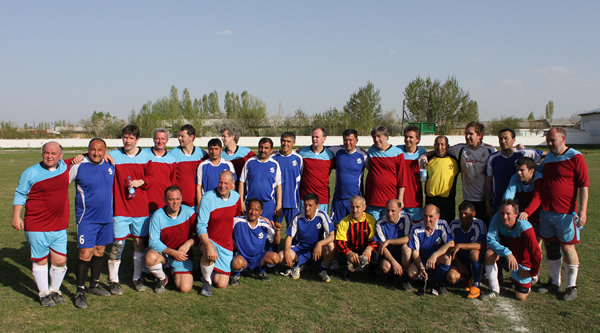 The Uzbek team were obviously so touched by these generous gifts that they allowed many more incursions into their half resulting in a goal. They also conceded a penalty. The final result was a respectable 4-2 to Uzkabel but two magnificent shots by Willo and Ed hit the post and an excellent cross to Karl's head just went high. An enjoyable game nevertheless. RCdeB scorers: Claudio (p), ? Arrived at "Buxoro" Sport Krjmursi stadium with its floodlights clearly modelled on the "tower of death". The ref suggested 30-35 minutes each way but Chris Hough insisted on 40-45, turned out to be a crucial move. The opposition had a couple of fast players they scored 4 in first 30 mins and it looked like a walk-over until Chris Hough suddenly upped the pace against the tiring local team and scored two great goals. In the second half RCdeB attacked strongly and Karl managed 2 beautiful goals levelling the score. Buxoro then brought their pro back on and managed to score twice more one from a dodgy decision of a free kick just outside the area. Assuming they had it in the bag they withdrew their ringer but, in a dramatic turn of events, in the last 2 minutes of the match, Simon scored, closely followed by a tremendous effort from the visitors with Karl pulling his third out of the hat in the dying moments. Hot water in the showers is a scarce commodity so local bar whilst we waited for Steve to change. 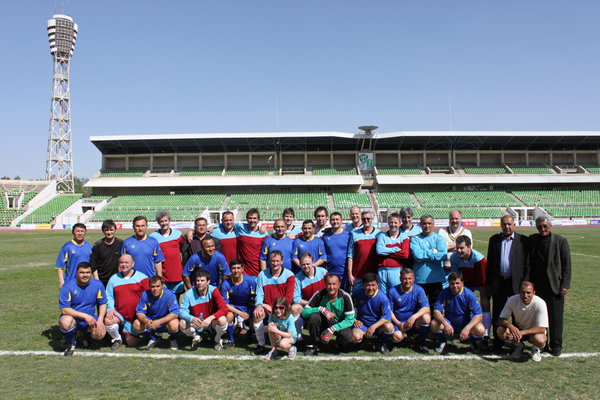 A promising start as RCdeB played as a team and didn't allow the Samarkand squad many chances until 20 mins into the match a penalty was awarded. By half time they had 4 goals (at least one off side) to our 1, a fine flick on by Will Ollard. After half time they scored 2 more goals but so did we a fine header from Karl and a superb shimmy past 2 defenders drilled into the top of the net by Steve. A shame not to have a more even score line but there were certainly a few decisions that went against us. After the game we were shown to a small stream as the only available place to wash so we returned in our smelly kit but not until we had all signed autographs for the kids and given them some gifts including some pens that didnt work - a great pr job for British goods.